Canon Powershot SX 150 regression in colors 5.5 vs 5.3? I was trying to develop some old files taken with my Canon Powershot SX 150, using CHDK, and converted to DNG (from DNG, in order to save a lot of disk space) using Adobe Dng Converter. 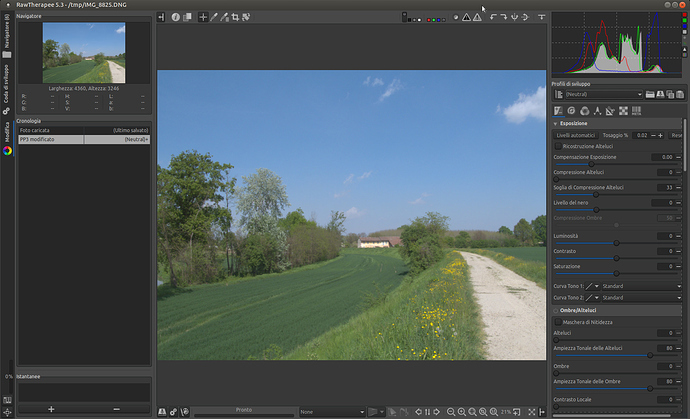 At the begin i was thinking about camera bad colors, but i have just tried with Raw Therapee 5.3 (from ubuntu 18.04 repos) and it delivers much better colors than 5.5 appimage. The color tab looks the same (camera standard). I think there is something that has changed in the DNG reading, and i find really difficult to get pleasant colors with 5.5 .
if I use in both input profile/camera standard, the two images are very different: dev image is washed out. if I use in both input profile/custom and I select the same DCP, I get the same output. As it seems there is no DCP for powershot SX150 IS in Adobe DNG converter 11-2-1, I choosed DCP for SX1 IS. Opened your DNG in RT final release versions 5.4 and 5.5. Identical and like your second image above. With Auto Levels only, both appeared as your first image. @agriggio How do we solve this case. Is just a camconst.json entry needed? Would it be possible to be more explicit when dng matrix is active. Manual override? Currently you can only really know if there’s a camconst but not really if adobe or dng matrix is active? Sorry for asking, but where should i put then the file? I have tried creating a file called camconst.json with the text below in the same dir of the option file (~/.config/RawTherapee) but nothing changes. I’m using the 5.5 appimage. But now i can also try to compile from git. I don’t know for appimage if it’s possible to change the camconst.json file at all. @Carmelo_DrRaw knows. If you compile from git just look for the camconst.json in folder rtengine of your git source and change the entry as mentioned in my post. Then build and it should work. The content will go into an AppDir folder and you can change internal files. Would it be possible to be more explicit when dng matrix is active. Sorry I meant the royal you or you all, not you personally.